Photo: Thomas Wynne House, ca. 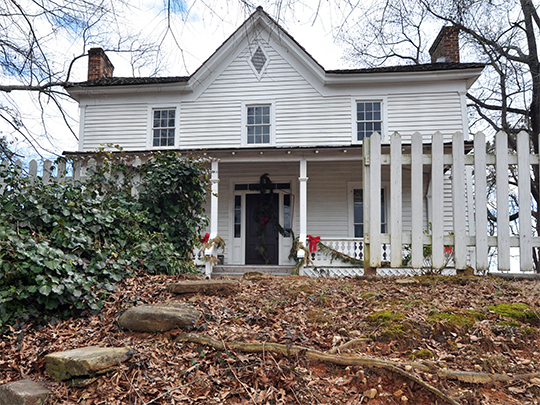 1820s, U.S. Route 29, North of Lilburn, GA. Listed on the National Register of Historic Places in 1977. Photographed by User:Rheave (own work), 2010, [cc-by-3.0 (creativecommons.org/licenses/by/3.0)], via Wikimedia Commons, accessed September, 2013. The Gwinnett County Justice Center is located at 75 Langley Drive, Lawrenceville GA 30045; phone: 770-822-8000. Gwinnett County was established in 1818 and named for Button Gwinnett (1735-1777). Gwinnett was a member of Georgia's Provincial Council, and one of 5 Georgians elected to attend the U.S. Second Continental Congress which he attended and became one of the signers of the Declaration of Independence. He was instrumental in the drawing of Georgia's State Constitution which was adopted in 1777.